I want to convey our deepest appreciation to you and your staff for helping my Fiancee, Sirirat (Noi) and I, in obtaining the K-1 Fiancee Visa that we have wanted for so long. I would like to relate to your potential customers the professionalism with which you handled our case. Due to the fact that I had to return to the USA in order to work, we were in need of an Immigration Lawyer that could help us realize our dream of being together and becoming Husband and Wife. I realized that as important as thisK-1 Fiancee Visa was to us and because of the complexity of it; we could not attempt to do it ourselves. I had neither the expertise or the time, and I knew that it would be impossible for me to complete the I-129F application without going back to Thailand (which was out of the question at the time) to get the required documents that had to be translated and to do all the other things that were necessary to complete the entire visa application. I began by doing an online search for a competent Immigration Lawyer. I quickly decided against a US based firm, thinking that there was too much that had to be done in Thailand and we wanted someone that understood the Thai people and culture. I looked at several different Immigration Law Firms in Thailand but was most impressed with U.S. Immigration Legal Advisors. I was happy to have found an American Lawyer that obviously loves and understands Thailand. From the very beginning U.S. Immigration Legal Advisors worked diligently to gather information and to carry my Fiancee Noi, to all the places required to obtain the necessary reports that are included in the application, thus allowing us to submit the application in a timely manner. Within a few months we had approval and were on to the next step. The hardest part in the entire process was waiting for approval and a scheduled interview date at the US Embassy. Although they met with us to advise us on what to expect at the interview and to offer advice on what Noi should wear and also how to present herself, we were both concerned and Noi was very nervous about the interview itself. On the day of the interview, they noticed Noi’s anxiety and began to speak with her and was able to calm her and soon had her laughing and feeling much better about the interview. It was apparent that they really care about their clients and understand their feelings. The interview went very good, she was granted the K-1 Fiancee Visa, and Noi and I were very relieved. We both feel that we owe our success to U.S. Immigration Legal Advisors for their professionalism and concern for their clients. 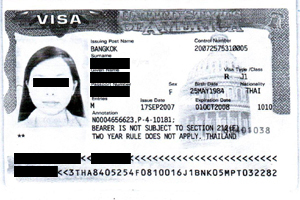 I would recommend the capable staff of U.S. Immigration Legal Advisors to everyone who wishes to obtain a US visa for his Thai lady. There is a reason that U.S. Immigration Legal Advisors can boast a 100% record, and that is because they are Professionals and they care.